To and from the Albuquerque airport to ski resorts, spas, weddings, hotels, casinos, Convention Center, Wine Tours, parties, graduation, prom night, Special Events, corporate transportation or wherever you need to be in New Mexico, Reserve a limousine with Santa Fe Limo anytime, on-line or call 505-848-9999,Santa Fe Limousine has you covered. 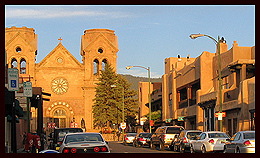 Santa Fe Limo takes you to Albuquerque, Rio Rancho, Santa Fe, Taos or wherever you need to be - wherever you need to go. Taking care of your business is Santa Fe Limo’s business. No reservation is too small or too big. Santa Fe Limo has single vehicles that range in seating from one to 22 people. Santa Fe Limo also offers an onsite Meet and Greet service at the airport, as well as coordinates multi-flight group for arriving and departing clients. Rest your worries with the experienced, professional Santa Fe Limo staff and its commitment to vehicle quality and fulfilling all your rental transportation needs. Santa Fe Limo wants to be your go-to limo service for when you need transportation you can depend on. Customers use Santa Fe Limo for business, pleasure and special occasions. Our limousines service the following areas and hotels in Santa Fe: the Santa Fe Plaza, Ski Santa Fe, Site Santa Fe, Hotel Santa Fe, El Dorado Hotel & Spa, Palace of the Governors, La Fonda Santa Fe, the Santa Fe Inn, and the Hotel Saint Francis. © Copyright 2010 Santa Fe Limo : Limousine Service in Santa Fe | All rights reserved.